Convert all your popular video files into AVI video formats. ACDSee Mobile for Palm OS? Excellent computer tool downloads from the greatest in download catalogs! Surf the popular apps categories, learn the freshest renews of the famous apps, and acquire directly! Do not miss an option to recieve the best software solutions: apply SoftEmpire directory to recieve package for free. Check out the catalog of freeware and computer software releases. Search among operating system programs, recieve controllers, softwares for relax, and all other types of software for your laptop or digital gadgets! 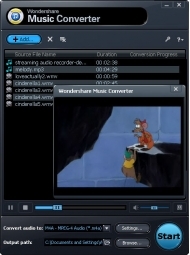 Wondershare DRM Music Converter features out as a professional DRM remover and powerful music converter, which can convert both DRM protected and unprotected music into various regular formats that compatible with digital players like iPod, iPhone, Zune, PSP, Creative Zen, mobile phone, etc. All codec built in ensures Wondershare DRM Music Converter win over the other music converters by faster conversion speed and amazing output audio quality----definitely no loss, no incoherency. Supporting drag-drop and batch convert target music file makes Wondershare DRM Music Converter more humanized and convenient to use, customers&#226;?? need always ranks the first in our design principle. Input formats: DRM WMA, WMV, M4V, M4A, M4B, M4P, Mp3, AVI, MOV, 3GP, MP4, RMVB, ASF, FLV, etc. Output formats: MP3, WMA, AAC, AC3, OGG, WAV, APE, M4A. Powerful function, easy-to-use, and clear-cut interface, which is Wondershare Media Converter&#226;? ?s permanent pursuit. Import target file, preset the output format and effect, then hit convert, all jobs done with only 3 steps.